Tanks Giving is fast approaching! I am going to re-post several of the most popular Thanksgiving related posts over the next few days you help you get ready for the big feast! First up: Steak House Yeast Rolls! Needing to develop some recipes for a couple of TV shoots coming up, I have been going through a lot of recipes. This recipe for Steak House Yeast Rolls was a consideration but as I was working through the recipe, the realization that this would be far too complicated to do on Charlotte Cooks, my TV show on PBS in the Charlotte market. With only 26.45 minutes to fill, two 2-hour rising times, mixing, shaping, baking, making a filling for cinnamon rolls, icing, would take an entire season, not 26 minutes. 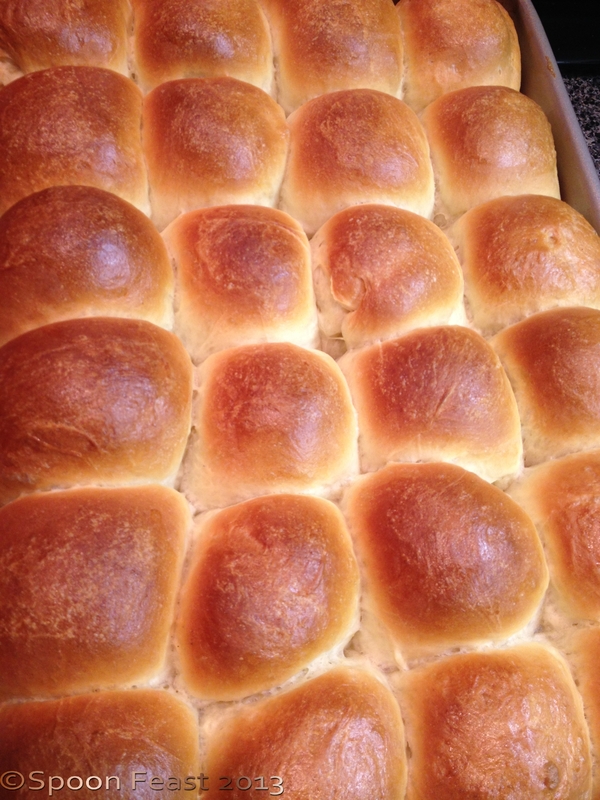 You have the pleasure of the recipe and variations, my neighbors will enjoy a slab of rolls. Since I started taking a nutrition class a couple of weeks ago, I have seriously increased the awareness of what I am eating and what is in those lovely morsels I select to stuff in my face. 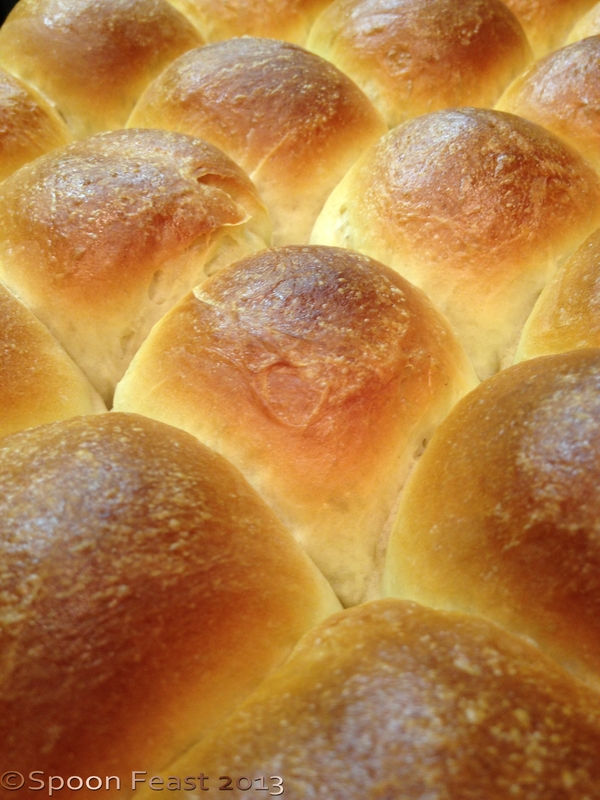 Making these rolls at home ensures you are using good wholesome ingredients. No dough conditioners, artificial flavors or stabilizers. Just fresh butter, eggs, organic flour, sugar, milk and yeast. The dough feels great and gives your arms a work out. Heat the milk and water to 110°F. Whisk the yeast into the heated milk and water. Let sit for 5 minutes, it should become frothy and bubble. Add the butter, eggs, sugar and salt to a large bowl, whisk in the milk and yeast mixture. Add the flour one cup at a time, creating a shaggy dough. This can be done in a mixer with a dough hook but the final kneading will have to be done by hand so you don’t burn out your machine. unless, or course, you have a really heavy-duty mixer. I don’t stress my Kitchen-Aid stand mixer with the final kneading. Initial mixing yes, but not the final knead. On a lightly floured surface, turn out the dough and knead until it is smooth and elastic. Form it into a nice round ball. Butter the inside of a large bowl, Roll the dough ball to cover the surface with butter then place the ball in the bottom of the bowl. 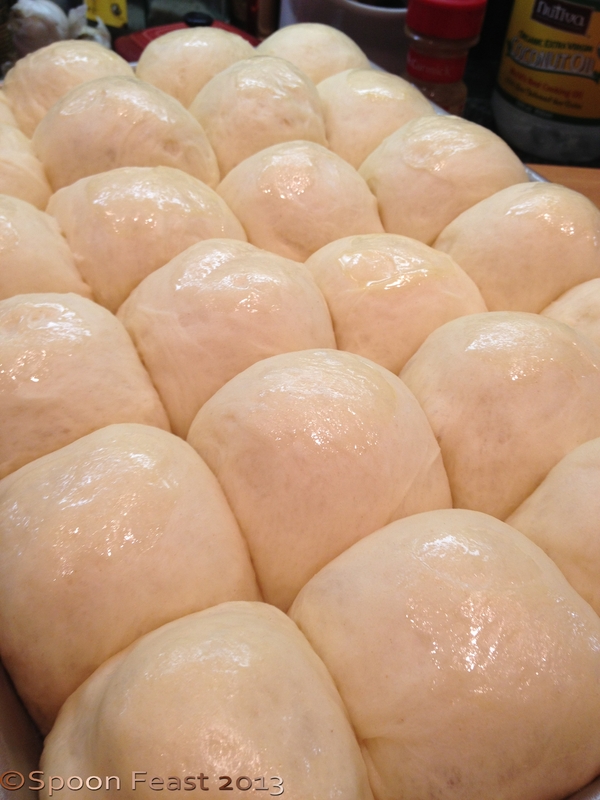 Cover with plastic wrap that has been also oiled to prevent the rising dough from sticking to the wrap as it rises. 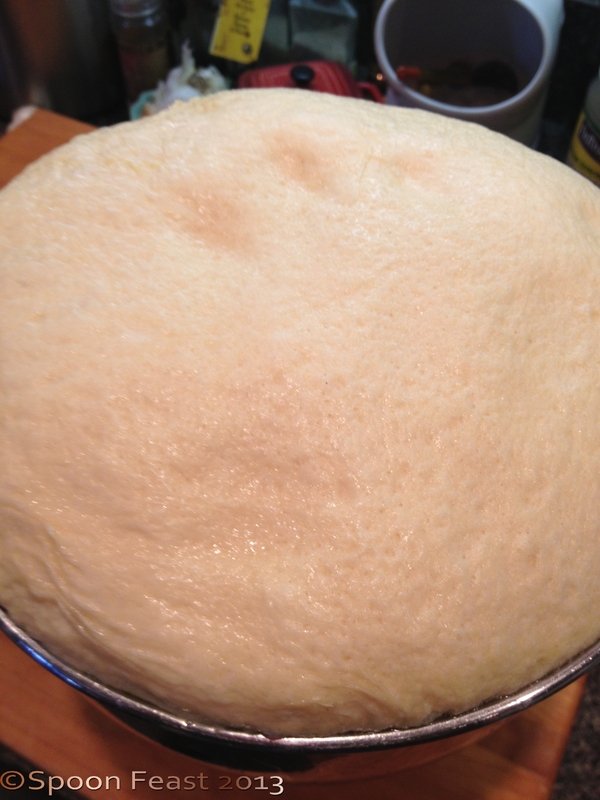 Allow to rise in a warm place until the dough has doubled in size. This may take 1-1/2 to 2 hours. Punch down the dough and divide the dough in half. and cut even size rolls. Weigh each roll to weigh 1.70 ounces. Lightly roll them to shape into balls. Butter a 9 x 12 baking pan. Place each roll in rows 4 x 6, allowing a small bit of space between each roll. This space will fill in as the rolls rise. Cover with oiled plastic wrap. Allow to rise again, until doubled in size. Once the roll pan is full, you will have some left over dough. 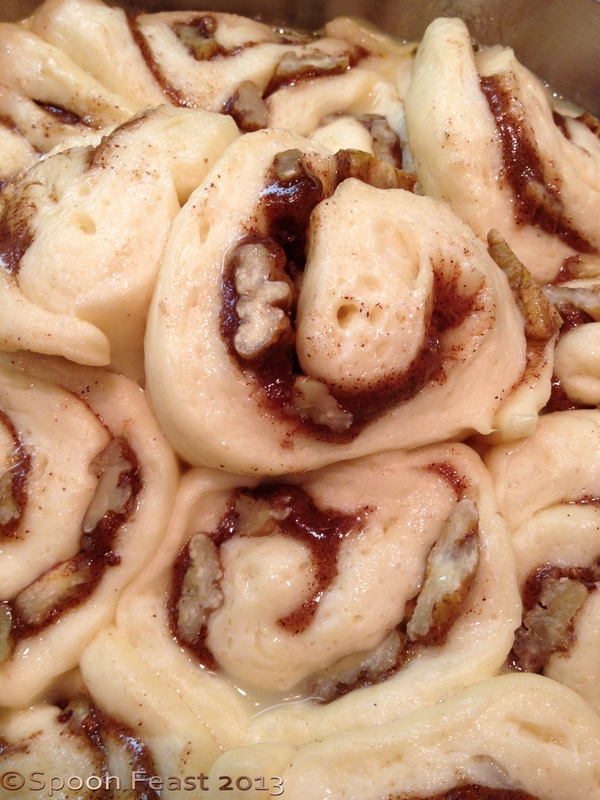 This dough is perfect for some amazing cinnamon rolls! Spread the butter cinnamon mixture over the rolled out dough. Sprinkle the surface with pecans or walnuts. 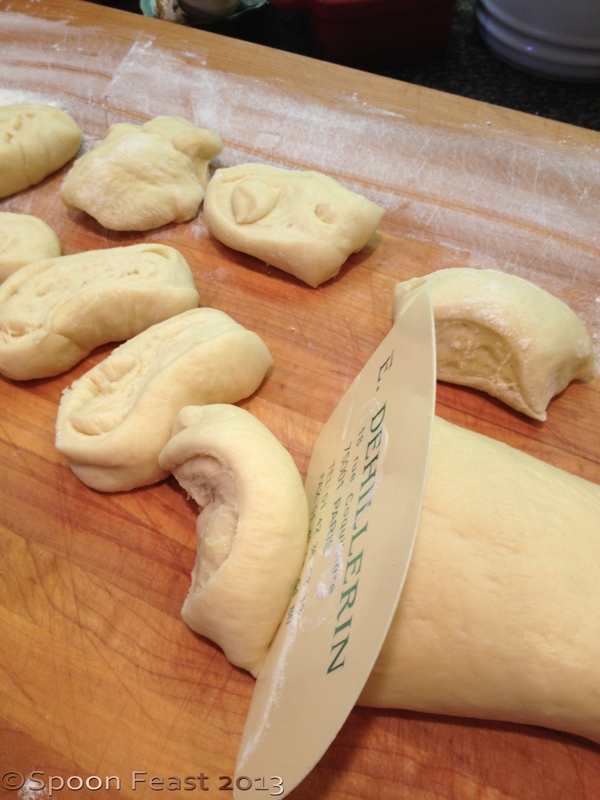 Roll the dough into a tight cylinder. Pinch the seam closed. Using a serrated blade, cut 2″ sliced from the roll. Place them cut side up (and down) in a well-buttered baking pan so the sides barely touch. Use a pan large enough to fill with the sliced cinnamon rolls. Allow these to double in size. Mix 1 egg with water to make an egg wash. Brush the surface of the rolls with egg wash just before putting them in the oven. Bake the rolls for 25-30 minutes, rotating the pan half way through for even baking. The rolls are done when they are golden brown. Remove from the oven and allow them to cool for at least 15 minutes before serving. This entry was posted in Recipes and tagged Bake, Bread roll, Cinnamon roll, Dough, Flour, Martha Stewart, Plastic wrap, Steak house yeast rolls, Sugar, Yeast Rolls. Bookmark the permalink. ← Happy Healthy Holidays Starting Soon! What a perfect neighbor you would be….homemade bread is my greatest food pleasure…My mother was a fabulous baker of bread…taste buds from the past…YUM! There is nothing quite like freshly baked homemade bread! These look really yummy. 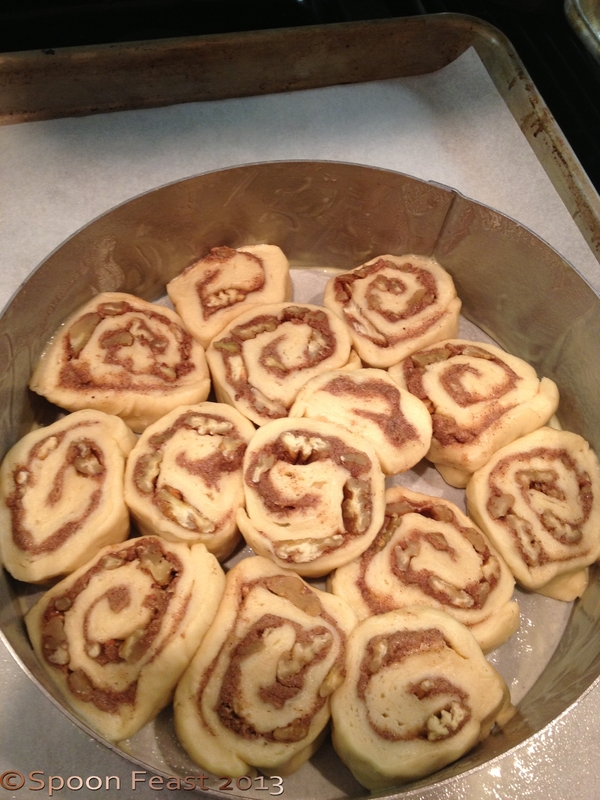 Thanks for linking to Small World Supper Club’s cinnamon rolls! You’re quite welcome, your rolls looked great! Thanks Uru, they are totally irresistible warm with butter! Thanks and your are welcome! Thanks Celia! These are better in my opinion because we know exactly what is in them. No dough conditioners, or other commercial ingredients. As I get older, these things are becoming more important to me. Thanks for this recipe. I love these little rolls. I look forward to reading all about your rolls Celia!